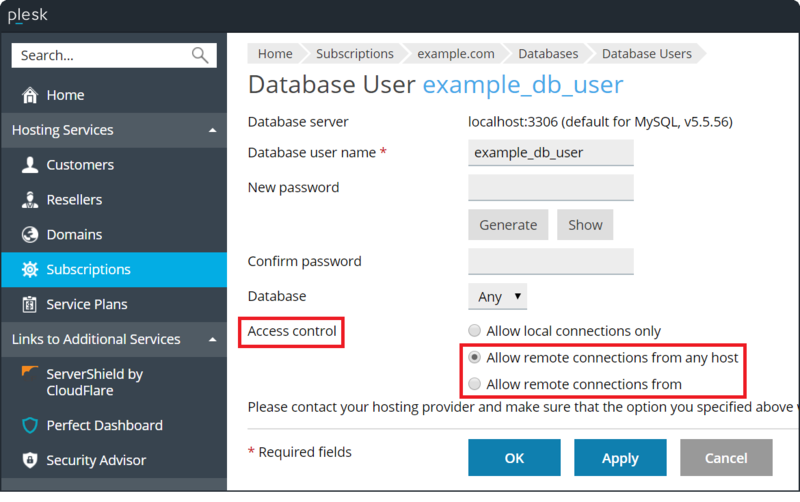 How to enable remote access to MySQL service on Plesk server? How to enable remote access to a MySQL database server? Note: make sure that MySQL port is not blocked by a firewall. By default, Plesk administrator does not have remote access. It is recommended to create a new user that will be used for the remote connection. However, you can do it for admin user also. Download, unzip and run the automatic script. Note: The remote access will be granted to 'admin' user. If it is required to give access to another user, follow also step 6 from section "Manual solution for Plesk 12. * and Plesk Onyx" below. Login to Plesk and make sure the option Allow remote connections from any host is enabled at Tools & Settings > Database Servers > Settings. Also, make sure that skip-networking parameter is not defined. Note: For the access to client's MySQL server on Windows, use PHPMyAdmin: Plesk > Tools & Settings > Database Servers - MySQL DB Admin. Note: to allow connections from any IP address use ' % ' character. Make sure that MySQL server is listening on the correct IP address. If Plesk firewall is used on the server, allow remote connection to MySQL in Tools & Settings > Firewall. If another firewall solution is used, ensure that access to port 3306 is allowed. # mysql -u "example_db_user" -p "password" -h "example.com"
Note: If the remote connection cannot be established check firewall settings - the required port possibly is blocked. This is how it was on a previous plesk server by default. Thank you for the feedback, the article was updated with additional details. Kindly note, that if the address is set to ::, the server accepts TCP/IP connections on all server host IPv4 and IPv6 interfaces. Please, make sure that vi should be started with root privileges (in case you are logged in not as root user use command "sudo vi"). Also, try another text editor like "nano". Glad to hear that. Thank you for the feedback. That is not possible as MySQL has its own users. How can i check if MySQL port is not blocked by a firewall? what can i do to have access from 2 ips in MYSQL? > "How can i check if MySQL port is not blocked by a firewall?" > what can i do to have access from 2 ips in MYSQL? How to install Plesk Firewall? 2. Go to "Plesk > Tools & Settings > Firewall"